It’s Sunday morning and I’ve had a good start to the day – I’ve read the paper, caught up on news, and finished watching CBS Sunday Morning’s weekly broadcast. I am full of ideas for the day, and the coming week – which usually stares me down at this time in the weekend. Tomorrow is martin Luther King Jr.’s birthday holiday and I have an extra day to prepare for the coming week. Friday was a planned teacher workday – school without kids and NO MEETINGS and I spent several hours yesterday working on school work. I took these photos last week at a Forest Preserve I pass on my way to and from school. A narrow shallow rock-bottomed river runs beside the road and the cold weather has iced over much of it, except for the space where it trickles over a natural dam and opens up before running downstream. I visited the preserve last weekend. The sun was shining and the world was full of shadows. 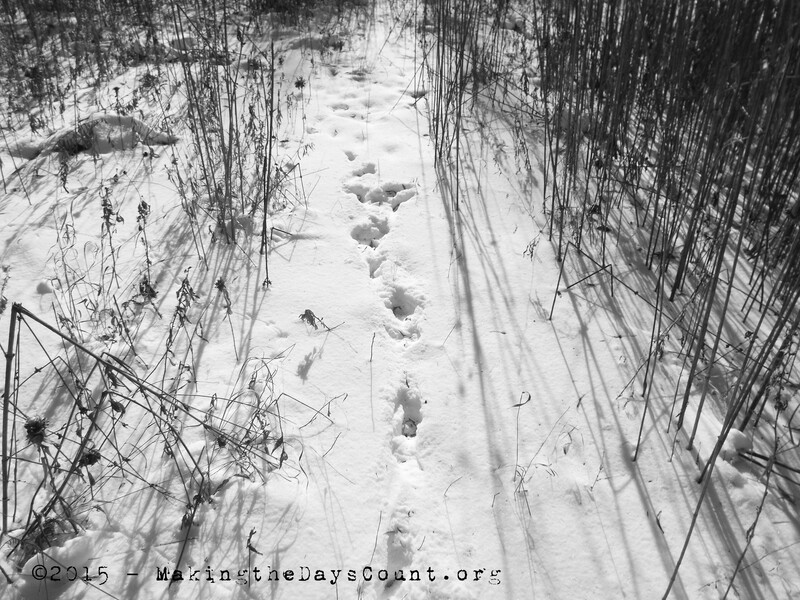 I found tracks in the fresh snow which I could only see because of the shadows and I startled a Canadian goose. I took my shots, captured the shadows and retreated home to where it was warm. It’s been cold here – we have had two days of no school due to the frigid temperatures, and even more frightful wind chills, the week before last. We were out of school Wednesday and Thursday and I spent the two days planning and watching in horror the events in Paris unfold. I first saw learned of the story through a Facebook post, then switched to CNN. It seems the entire world lies in worry of what awaits in the shadows, of those who are shadowed. Yet, the real power is in the power of the voice, the power of the pen, the power of people to stand up for what is right. When Friday morning came and we returned to school, I spent several minutes in my social class talking about the power of freedom and how it is frightening for some. Freedom and liberty shall overcome, always. I shared several political cartoons with the class explaining how humor and symbolism combine in art to tell a story, none was more powerful than the one above. I hemmed and hawed about this post so much so, that it almost died and didn’t get posted. In light of Martin Luther King Jr.’s birthday observation tomorrow it is important that I post, even if it is a week late. Over a week has passed since that horrible day in Paris. I am afraid the folks in shadows are still lurking waiting to strike against freedom and liberty, but freedom shall prevail – it is a far more powerful idea, than fear. I have been busy at school, I am half way finished with my school year. The year has had its ups and downs, but every day has counted, and there is more to come. Today is gonna be a great day, it’s warmed up enough outside for the snow to begin to melt in the yard and the icy walkways and driveway are clear. SO, I had better jump up, jump in and seize the day. Making the Days Count, one day at a time, one step for freedom and liberty, always moving forward. Today’s post is in response to the Daily Post’s Weekly Photo Challenge prompt on Word Press. For this week’s Photo Challenge, find the shadows. You can choose a literal interpretation and shoot an actual shadow, or you can play with the light and dark, and create a moody scene, or capture your subject in a rich and interesting way. I thought it was cold up here in NH, but I guess not if you all have to cancel school due to frigid temperatures! We had a nice 4-day weekend too due to teacher workshops and the holiday. It’s nice to know that you talk to your students about the importance of freedom. I don’t think we can talk about it enough. Thank you, I stopped a little further up river last night and took some new photos that I hope to post this weekend. At school there is always an opportunity to teach kids the important lessons of life – liberty, freedom, the value of hard work, and so on and so forth. We are finishing our study of the Civil War and I find interesting parallels between the time period and now. It seems we need to re-learn our history, or for some learn it for the first time. Have a wonderful weekend and enjoy the week ahead. Great post Clay. What a nice way to spend a few days off. Your photos are lovely and capture the scene admirably. Thanks for sharing. Thank you, I am lucky to have such a pleasant drive to school and back – at least most days. The traffic in the afternoon is a bit frustrating, but I am part of the traffic, too. This weekend will go very quickly – I have science fair with my kiddos for most of the day and then an evening with the family. It’s gonna be a great day – have a wonderful week and thank you for stopping by. Yes, it’s been over a week since the awful attack on Charlie Hebdo. A week in which the shadows have lengthened, the isssues become ever more complex. Dark times ahead, I fear. It’s hard to feel optimistic. I agree – it’s the folks who lurk in shadows that worry me most and trouble me. The idea of freedom is a frightening idea for a relatively small few who are determined to impose their ideas on the majority. My students are reading Animal Farm in the literature classes now – I am not teaching it – but I’ve read it and I saw a sign posted in a classroom window – FOUR LEGS GOOD, TWO LEGS BAD… took me back to reading and re-reading Orwell’s work. Freedom will always win, but I am afraid that many of our people have become accustomed to the type of thinking that Orwell described in 1984 – thoughtcrimes and doublespeak. Freedom is powerful, but it is messy and requires people to be active and engaged. and I could go on and on…. Freedom will prevail, I am certain of it. Thank you for stopping in and I am so sorry about your copper beech, I read it and it made me think of a Sherlock Holmes story. That’s for another day. have a wonderful week. Thank you, Clay. A fortnight later, and I feel less optimistic than you. I hope that ultimately, you will be right. But I fear dark days ahead, with many people falling back on prejudice in negative ways. You’re right, we need to be active and engage! You too – have a good week. Boy, you DO drive by some very pretty places on your way to and from school. Lucky you. And lucky us that you choose to share them with us. The subject of shadow does seem like an apt metaphor for the Paris killings, doesn’t it? Coming out of the shadows, in an instant, is what terror is all about. The world feels scarier. What a gift you gave your students, talking to them and helping them to understand the importance of standing up against tyranny. And how ironic that tomorrow we celebrate the life of a man who did just that and made the world a better place for so many others because he did. Good job, Clay. Good job. Thank you Mary – teaching 8th grade is much different than 7th grade, the students are more interested in the world around them – we watch a ten minute capsule of the news a couple of times each week – CNN Student News and they love it. The cartoons were a good way to show they magnitude of the awful act in Paris. There was one cartoon with two pencils as if they were buildings and an airplane heading for them…. they got it..we only have fear fear itself. thank you for stopping by and weighing in. I do enjoy the drive past the forest preserves, but there is a stretch that pushes everyone of my buttons! Have a wonderful week. Enjoy the extra day. Love the photos! Thanks Susie! I love watching the river as I drive by and I’ve stopped several times just to watch it run….it’s a great place to unwind after a day full of teaching. Thanks for stopping by and have a wonderful week! Half way finished with the school year already? Time flies by. Enjoy the three day weekend! Phil, time waits for no one. and the three day weekend is almost done, too. I promised my wife I would help with a project that should take an hour or two…but that is what it should take! Have a great week!